Sen. Lindsey Graham (R-SC) told Fox News Friday that if President Trump is able to get North Korean leader Kim Jong Un to agree to denuclearize, the president should get the Nobel Peace Prize. Graham praised Trump for the stunning progress made in getting North and South Korea leaders to meet Thursday to discuss denuclearization. 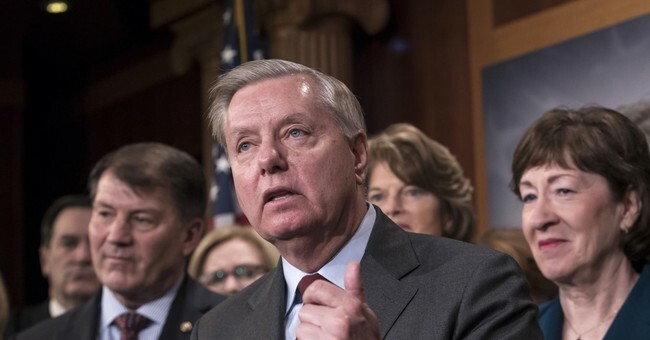 It wouldn't have happened without Trump," Graham said Friday. “The fact that the North Korean and the South Korean president met and they vowed to end the war. What happened? Donald Trump convinced North Korea and China he was serious about bringing about change," he emphasized. "We're not there yet, but if this happens, President Trump deserves the Nobel Peace Prize." “All of the criticism of President Trump on fire and fury and maximum pressure, I’m glad he didn’t listen to all those who failed before him,” he said. However, Graham added a cautionary word as well. "A word of warning: the worst thing Kim Jong Un could do is play Trump," he said. "To go through all these motions and go back to the old way of doing business, Donald Trump will not tolerate being played." "We're either going to have peace or we're going to have a war now because Kim Jong Un has made a mistake if he's not serious," he concluded.